Indian Village Staff is full. The information presented below is for informational and archival purposes only. The OA Indian Village wants you! Village vignettes: Our village will be filled with American Indian village areas representing several tribes from across North America which depict life for these tribes. Indian Lore Merit Badge: Jamboree participants will be able to work on the Indian Lore Merit Badge nestled in the OA Indian Village against the backdrop of American Indian villages. The instructors of Indian Lore merit badge will use the resources provided by their brothers among the various Indian villages to create a fantastic delivery of the merit badge requirements. 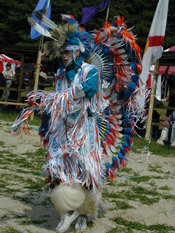 The Indian Lore Merit Badge will be located in the Indian Village. Daily flag ceremony: The Indian Village staff will raise flags in the Indian tradition each day. Daily dance vignettes: Some of the best Indian dancers and singers in the OA will travel throughout the Jamboree area to "show their stuff" and provide dance and singing demonstrations for the Jamboree participants. And, of course: Having FUN! So, if this sounds like YOUR thing @ the 2010 Jamboree, sign up today to join our Indian Village staff!